Juli/August: up to around 30 C / 86 F.
Winter: around freezing point. Due to the low elevation there’s only a very moderate amount of snow falling during winter. The climate in general is moderate warm during summer and moderate cold during winter. The best time to travel to Germany is probably during Spring/Summer. Cologne is one of Germany’s best-loved cities. With its cathedral, churches, museums, the River Rhine, and a host of exciting events, it draws over 100 million visitors every year. A large number of them depart deeply impressed not only with the city’s many attractions but also with the celebrated Cologne way of life. And the “Cologne way of life” is highly infectious – reason enough to pay Cologne a visit! Germany’s fourth-largest city boasts a long and colourful history. 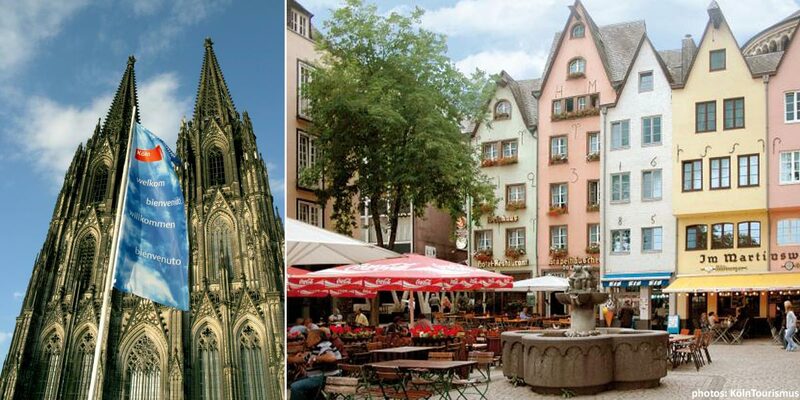 For the past 2,000 years, Cologne has served as a melting pot for a host of nationalities. First the Romans, then the French, came to Cologne. They were followed by emigrants from Eastern Europe and Turkey, and by urban newcomers from the German provinces such as the Eifel and Westphalia. Today, their descendants all live together in the city’s 86 boroughs. This has given rise to a mentality that grants everyone the right to live as he or she sees fit – an attitude expressed in one of the many sayings typical for the city: “Jede Jeck es anders” (“It takes all sorts!”). The people of Cologne are outgoing, down-to-earth, tolerant, always ready for a party and often a little irreverent. All this is accompanied by a highly developed sense of local patriotism, which the people of Cologne delight in cultivating. No other place in Germany has so many songs – there are tens of thousands of them – and so many musical groups extolling the city’s virtues in the distinctive local dialect. Famous groups include Bläck Fööss, the Höhner, Kasalla or Brings. Their concerts help to project Cologne’s reputation way out into the world beyond the Rhineland. In the city itself, it is not only in concert halls and at the famous carnival that such songs are heard: the people of Cologne also delight in celebrating their affection for their beloved city in the football stadium, at ice hockey games of the local team, Kölner Haie, and basically every time there’s a party. Some are inclined to disparage this somewhat uncritical devotion as “Colognomania” and excessive self-regard. Yet it is clear that many visitors to Cologne keep coming back precisely because of the city’s outgoing and open way of life and its affectionate and partygoing mentality. The carnival, which plays a major part in social life, is also an opportunity to celebrate Cologne’s idiosyncracies. Not for nothing is Cologne the traditional stronghold of the German carnival. There are 160 carnival associations and countless clubs in which the people of Cologne celebrate the “fifth season” of the year. More than 10,000 revelers take part in the traditional Rose Monday parade, and more than 8,000 in the popular “Schull- un Veedelszöch” parade the day before. Cologne has more than 3,000 bars and restaurants representing a wide variety of cuisines that offer something for every taste. In addition to the down-to-earth cooking of the typical kölsch brewery restaurants, there’s a whole range of attractive restaurants with creative and interesting cuisine. Visitors will enjoy exploring Cologne’s numerous speciality food shops, choice culinary events and lively bar and pub scene, as well as its top-class hotel restaurants and bars — not to mention its many cafés with urban flair or a cosy neighbourhood atmosphere. Cologne’s culinary diversity is rounded out by top-class restaurants with outstanding credentials (Michelin stars and Gault & Millau points), original food shops, farmers’ markets and food-themed museums featuring everything from mustard to chocolate. dialect. Kölsch is served by a waiter known as a Köbes in typical tall cylindrical glasses called Kölsch-Stangen. The brewery restaurants, or Brauhäuser, serve traditional fare that is hearty and down to earth. Some of the dishes may require getting used to — such as Halver Hahn (half of a rye bread roll topped with a thick slice of mature Dutch cheese and mustard) and Himmel un Äd (Heaven and Earth), which consists of mashed potatoes with fried black pudding and applesauce. Another ironically named dish is Kölscher Kaviar — a piece of black pudding with mustard and a rye bread roll. The name probably originated among Brauhaus regulars as a parody of the upper classes. whiskey tastings. A visit to the chocolate, mustard or wine museum offers fascinating insights into multifaceted worlds of taste, and special shops such as an artisanal sweets maker and a liquorice “pharmacy” are sure to delight visitors with a sweet tooth. The famous Kölsch way of life, which is open, friendly and communicative, is reflected in Cologne’s wide variety of culinary establishments. The city’s international cuisine is dominated by Italian and Mediterranean restaurants, but countless other nations, ranging from Ethiopia to Vietnam, also cultivate their culinary arts in Cologne. In addition, Cologne natives and guests alike can celebrate German hospitality in the countless bistros and cafés offering delicious snacks and homemade cakes. In recent years, a growing number of restaurants with sophisticated and creative cuisine have expanded Cologne’s culinary portfolio. At last count, 11 top-class restaurants in Cologne had received Michelin stars.